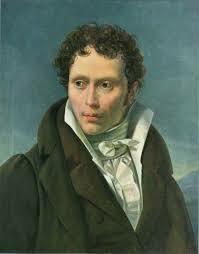 Compassion [Mitleid] is the key word in Parsifal — as it is, and because it is, in Schopenhauer's ethics. The sole musical motive in the opera that does not originate in the orchestra comes on the words, "Given knowledge by compassion, the stupid innocent..." [Durch Mitleid wissend, der reine Tor...] Although the opera was composed during the period 1877-82, the centrality of compassion to Wagner's conception of it stretches back over two decades to his first reading of Schopenhauer. he essay On the Basis of Morality (Über die Grundlage der Moral) is one of Arthur Schopenhauer's two major works in ethics. In this "prize essay", he argues that morality can only be based upon compassion. On the Basis of Morality is divided into four sections. The first section is an introduction in which Schopenhauer provides his account of the question posed by the Royal Danish Society (as the subject of a "prize essay") and his interpretation of the history of western ethics. In the second section, Schopenhauer embarks on a critique of Kantian ethics, which he viewed as the orthodoxy in ethics. The third section of the work (from which this extract and those that follow it have been drawn) is Schopenhauer's positive construction of his own ethical theory. The final section of the work provides a brief description of the metaphysical foundations of ethics. chopenhauer endorsed Kant's view that the morality of an action can be judged in accordance with his distinction of treating a person as an end not as a mere means. By drawing the distinction between egoism and unselfishness, Kant had correctly described the criterion of morality. For Schopenhauer, this was the only merit of Kant's Groundwork of the Metaphysic of Morals. In his view, an act cannot have moral value if it is in any way egoistic; and he regarded Kant's categorical imperative (act as if your action should be the basis of a univeral law; or, "do as you would be done by") as egoistic. Amfortas! Die Wunde! Die Wunde! Sie brennt in meinem Herzen! O, Klage! Klage! Furchtbare Klage! nun blutet sie in mir. On The Basis of Morality - Part III, Chapter V, or §16. Translated by Arthur Brodrick Bullock. he preceding considerations, which were unavoidably necessary in order to clear the ground, now enable me to indicate the true incentive which underlies all acts of real moral worth. The seriousness, and indisputable genuineness, with which we shall find it is distinguished, removes it far indeed from the hair splittings, subtleties, sophisms, assertions formulated out of airy nothings, and a priori soap-bubbles, which all systems up to the present have tried to make at once the source of moral conduct and the basis of Ethics. This incentive I shall not put forward as an hypothesis to be accepted or rejected, as one pleases; I shall actually prove that it is the only possible one. But as this demonstration requires several fundamental truths to be borne in mind, the reader's attention is first called to certain propositions which we must presuppose, and which may properly be considered as axioms; except the last two, which result from the analysis contained in the preceding chapter and in Part II, Chapter III. No action can take place without a sufficient motive; as little as a stone can move without a sufficient push or pull. Similarly, no action can be left undone, when, given the character of the doer, a sufficient motive is present; unless a stronger counter-motive necessarily prevents it. Whatever moves the Will, this, and this alone, implies the sense of weal and woe, in the widest sense of the term; and conversely, weal and woe signify "that which is in conformity with, or which is contrary to, a Will." Hence every motive must have a connection with weal and woe. Consequently every action stands in relation to, and has as its ultimate object, a being susceptible of weal and woe. This being is either the doer himself; or another, whose position as regards the action is therefore passive; since it is done either to his harm, or to his benefit and advantage. Every action, which has to do, as its ultimate object, with the weal and woe of the agent himself, is egoistic. The foregoing propositions with regard to what is done apply equally to what is left undone, in all cases where motive and counter-motive play their parts. From the analysis in the foregoing chapter, it results that Egoism and the moral worth of an action absolutely exclude each other. If an act has an egoistic object as its motive, then no moral value can be attached to it; if an act is to have moral value, then no egoistic object, direct or indirect, near or remote, may be its motive. In consequence of my elimination in Part II, Chapter III, of alleged duties towards ourselves, the moral significance of our conduct can only lie in the effect produced upon others; its relation to the latter is alone that which lends it moral worth, or worthlessness, and constitutes it an act of justice, loving-kindness, etc., or the reverse. rom these propositions the following conclusion is obvious : The weal and woe, which (according to our third axiom) must, as its ultimate object, lie at the root of everything done, or left undone, is either that of the doer himself, or that of some other person, whose role with reference to the action is passive. Conduct in the first case is necessarily egoistic, as it is impelled by an interested motive. And this is not only true when men as they nearly always do plainly shape their acts for their own profit and advantage; it is equally true when from anything done we expect some benefit to ourselves, no matter how remote, whether in this or in another world. Nor is it less the fact when our honour, our good name, or the wish to win the respect of someone, the sympathy of the onlookers, etc., is the object we have in view; or when our intention is to uphold a rule of conduct, which, if generally followed, would occasionally be useful to ourselves, for instance, the principle of justice, of mutual succour and aid, and so forth. Similarly, the proceeding is at bottom egoistic, when a man considers it a prudent step to obey some absolute command issued by an unknown, but evidently supreme power; for in such a case nothing can be the motive but fear of the disastrous consequences of disobedience, however generally and indistinctly these may be conceived. Nor is it a whit the less Egoism that prompts us when we endeavour to emphasise, by something done or left undone, the high opinion (whether distinctly realised or not) which we have of ourselves, and of our value or dignity; for the diminution of self-satisfaction, which might otherwise occur, would involve the wounding of our pride. Lastly, it is still Egoism that is operative, when a man, following Wolff's principles, seeks by his conduct to work out his own perfection. In short, one may make the ultimate incentive to an action what one pleases; it will always turn out, no matter by how circuitous a path, that in the last resort what affects the actual weal and woe of the agent himself is the real motive; consequently what he does is egoistic, and therefore without moral worth. There is only a single case in which this fails to happen: namely, when the ultimate incentive for doing something, or leaving it undone, is precisely and exclusively centred in the weal and woe of someone else, who plays a passive part; that is to say, when the person on the active side, by what he does, or omits to do, simply and solely regards the weal and woe of another, and has absolutely no other object than to benefit him, by keeping harm from his door, or, it may be, even by affording help, assistance, and relief. It is this aim alone that gives to what is done, or left undone, the stamp of moral worth; which is thus seen to depend exclusively on the circumstance that the act is carried out, or omitted, purely for the benefit and advantage of another. If and when this is not so, then the question of weal and woe which incites to, or deters from, every action contemplated, can only relate to the agent himself; whence its performance, or non-performance is entirely egoistic, and without moral value. ut if what I do is to take place solely on account of someone else; then it follows that his weal and woe must directly constitute my motive; just as, ordinarily, my own weal and woe form it. This narrows the limits of our problem, which may now be stated as follows: how is it possible that another's weal and woe should influence my will directly, that is, exactly in the same way as otherwise my own moves it? How can that which affects another for good or bad become my immediate motive, and actually sometimes assume such importance that it more or less supplants my own interests, which are, as a rule, the single source of the incentives that appeal to me? Obviously, only because that other person becomes the ultimate object of my will, precisely as usually I myself am that object; in other words, because I directly desire weal, and not woe, for him, just as habitually I do for myself. This, however, necessarily implies that I suffer with him, and feel his woe, exactly as in most cases I feel only mine, and therefore desire his weal as immediately as at other times I desire only my own. But, for this to be possible, I must in some way or other be identified with him; that is, the difference between myself and him, which is the precise raison d'etre of my Egoism, must be removed, at least to a certain extent. Now, since I do not live in his skin, there remains only the knowledge, that is, the mental picture, I have of him, as the possible means where- by I can so far identify myself with him, that my action declares the difference to be practically effaced. The process here analysed is not a dream, a fancy floating in the air; it is perfectly real, and by no means infrequent. It is, what we see every day, the phenomenon of Compassion [Mitleid]; in other words, the direct participation, independent of all ulterior considerations, in the sufferings of another, leading to sympathetic assistance in the effort to prevent or remove them; whereon in the last resort all satisfaction and all well-being and happiness depend. It is this Compassion alone which is the real basis of all voluntary justice and all genuine loving-kindness. Only so far as an action springs therefrom, has it moral value; and all conduct that proceeds from any other motive whatever has none. When once compassion is stirred within me, by another's pain, then his weal and woe go straight to my heart, exactly in the same way, if not always to the same degree, as otherwise I feel only my own. Consequently the difference between myself and him is no longer an absolute one. o doubt this operation is astonishing, indeed hardly comprehensible. It is, in fact, the great mystery of Ethics, its original phenomenon, and the boundary stone, past which only transcendental speculation may dare to take a step. Herein we see the wall of partition, which, according to the light of nature (as reason is called by old theologians), entirely separates being from being, broken down, and the non-ego to a certain extent identified with the ego. I wish for the moment to leave the metaphysical explanation of this enigma untouched, and first to inquire whether all acts of voluntary justice and true loving-kindness really arise from it. If so, our problem will be solved, for we shall have found the ultimate basis of morality, and shown that it lies in human nature itself. This foundation, however, in its turn cannot form a problem of Ethics, but rather, like every other ultimate fact as such, of Metaphysics. Only the solution, that the latter offers of the primary ethical phenomenon, lies outside the limits of the question put by the Danish Royal Society, which is concerned solely with the basis; so that the transcendental explanation can be given merely as a voluntary and unessential appendix. ut before I turn to the derivation of the cardinal virtues from the original incentive, as here disclosed, I have still to bring to the notice of the reader two observations which the subject renders necessary. Egoism: which desires the weal of the self and is limitless. Malice: which desires the woe of others and may develop into the utmost cruelty. Compassion: which desires the weal of others and may rise to nobleness and magnanimity. very human act is referable to one of these springs; although two of them may work together. Now, as we have assumed that actions of moral worth are in point of fact realities; it follows that they also must proceed from one of these primal sources. But, by the eighth axiom, they cannot arise from the first, and still less from the second; since all conduct springing from the latter is morally worthless, while the offshoots of the former are in part neither good nor bad in themselves. Hence they must have their origin in the third incentive; and this will be established a posteriori in the sequel. (2) Direct sympathy with another is limited to his sufferings, and is not immediately awakened by his well-being: the latter per se leaves us indifferent. Jean Jacques Rousseau in his Emile (Bk. IV) expresses the same view: Premiere maxime: il n'est pas dans le coeur humain, de se mettre a la place des gens, qui sont plus heureux que nous, mais settlement de ceux, qui sont plus a plaindre 2. The reason for this is that pain or suffering, which includes all want, privation, need, indeed every wish, is positive and works directly on the consciousness. hereas the nature of satisfaction, of enjoyment, of happiness, and the like, consists solely in the fact that a hardship is done away with, a pain lulled: whence their effect is negative. We thus see why need or desire is the condition of every pleasure. Plato understood this well enough, and only excepted sweet odours, and intellectual enjoyment. (Republic, IX, p. 264 sq., edit. Bipont) And Voltaire says: II n'est pas de vrais plaisirs, qu'avec de vrais besoms. 3 Pain, then, is positive, and makes itself known by itself: satisfaction or pleasure is negative simply the removal of the former. This principle explains the fact that only the suffering, the want, the danger, the helplessness of another awakens our sympathy directly and as such. The lucky or con- tented man, as such, leaves us indifferent in reality because his state is negative; he is without pain, indigence, or distress. We may of course take pleasure in the success, the well-being, the enjoyment of others: but if we do, it is a secondary pleasure, and caused by our having previously sorrowed over their sufferings and privations. Or else we share the joy and happiness of a man, not as such, but because, and in so far as, he is our child, father, friend, relation, servant, subject, etc. In a word, the good fortune, or pleasure of another, purely as such, does not arouse in us the same direct sympathy as is certainly elicited by his misfortune, privation, or misery, purely as such. If even on our own behalf it is only suffering (under which must be reckoned all wants, needs, wishes, and even ennui) that stirs our activity; and if contentment and prosperity fill us with indolence and lazy repose; why should it not be the same when others are concerned? For (as we have seen), our sympathy rests on an identification of ourselves with them. Indeed, the sight of success and enjoyment, purely as such, is very apt to raise the envy, to which every man is prone, and which has its place among the anti-moral forces enumerated above. n connection with the exposition of Compassion here given, as the coming into play of motives directly occasioned by another's calamity, I take the opportunity of condemning the mistake of Cassina4 , which has been so often repeated. His view is that compassion arises from a sudden hallucination, which makes us put ourselves in the place of the sufferer, and then imagine that we are undergoing his pain in own own person. This is not in the least the case. The conviction never leaves us for a moment that he is the sufferer, not we; and it is precisely in his person, not in ours, that we feel the distress which afflicts us. We suffer with him, and therefore in him; we feel his trouble as his, and are not under the delusion that it is ours; indeed, the happier we are, the greater the contrast between our own state and his, the more we are open to the promptings of Compassion. The explanation of the possibility of this extraordinary phaenomenon is, however, not so easy; nor is it to be reached by the path of pure psychology, as Cassina supposed. The key can be furnished by Metaphysics alone and this I shall attempt to give in the last part of the present treatise. now turn to consider the derivation of actions of real moral worth from the source which has been indicated. The general rule by which to test such conduct, and which, consequently, is the leading principle of Ethics, I have already enlarged upon in the foregoing Part, and enunciated as follows: Neminem laede; immo omnes, quantum potes, juva (Do harm to no-one; but rather help all people, as far as lies in your power.) As this formula contains two clauses, so the actions corresponding to it fall naturally into two classes [to be discussed in the next 2 chapters].